At age 14, Norfleet began competing on a local and regional level in kart racing, leading into a successful drag racing career resulting in top rank stats: winning 37 out of 52 events. In 2000, she switched her focus, setting her sights on dominating the track in entry level spec racing, competing in Bandolero cars. Eventually in 2004, Norfleet would move on to late model stock car racing on short tracks, later becoming the first African-American to obtain a NASCAR late model series racing license. The Norfleet family has deep connections to trailblazing, legendary racer “No. 34,” Wendell Scott. Scott was the first African-American NASCAR driver and the first African-American to win a race in NASCAR’s highest ranked Grand National Series. Under the mentorship of Scott, Bobby Norfleet would honorably represent the legacy of Wendell Scott, and race as number 34 throughout his career. 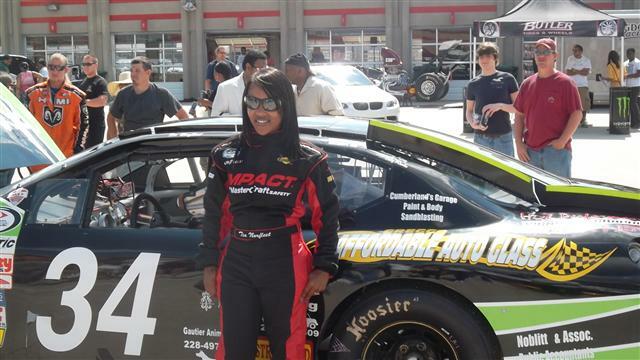 Familiar with bumps in the road, Tia Norfleet came to face her own challenges as a Black woman in NASCAR, having difficulty acquiring sponsorship, the key essential component to competing. It takes millions of dollars per year to race, and backers weren’t lined up to endorse Norfleet as one of their brand ambassadors. When opportunities did arrive, let’s just say she chose the high road to remain true to herself. With the support of her family, and leadership from her mentor and father, Tia Norfleet sets her sights on breaking barriers the “Norfleet” way.